When Will Thailand Hold its Election? 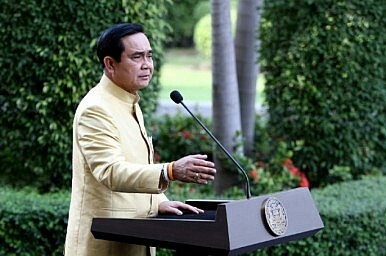 The junta pushes back polls to make way for a referendum on a new constitution. Thailand’s ruling junta delayed a general election by at least six months on Tuesday, in yet another sign that their grip on power will not be loosening anytime soon. According to Reuters, Deputy Prime Minister Wissanu Krea-ngam told reporters that polls would take place in August 2016 at the earliest to allow for a referendum to be held on a contentious new draft constitution (See: “Thailand Completes Troubling New Constitution”). The Thai cabinet had earlier agreed that a referendum should be held on the constitution, following the recommendation of the Constitutional Drafting Committee. “It will take place around August or in September,” Wissanu reportedly said. As I reported previously for The Diplomat, members of the Thai junta, including Wissanu himself, had already suggested as early as last December that while February 2016 was the earliest that an election would be held, the date could be pushed back by a further three months until May 2016. (See: “No Thai Election Until At Least February 2016: Deputy Prime Minister”). At that time, some were already skeptical that the timetable made sense. As I noted then, Pornchai Trakulwaranont, the prominent vice rector for administration at Thammasat University, told Xinhua that the process of carrying out a referendum would likely push polls back further out into mid-2016. He argued that while it would take at least three months to hold the referendum, there would also need to be an additional three to four months spent addressing issues coming out of the referendum and potentially modifying the draft charter. Wissanu now appears to have a roughly similar timeline in mind, albeit one dragging on till September. According to The Nation, he indicated that if a referendum were to be held in January, the government would need three to four months to amend various laws, after which an election will be held following no more than 90 days. National Reform Council whip secretary Alongkorn Ponlaboot also revealed that the whole process of holding a referendum would take at least six months, as three months would not be sufficient given the logistics, including distributing millions of copies of the draft charter to eligible voters. Aside from the timeline, there are several other uncertainties going forward. First, as I pointed out before, holding a referendum first requires an agreement about the exact shape of the new constitution before the National Reform Council approves it in a few months. That is hardly a straightforward process, particularly as it contains some controversial provisions designed partly to prevent any group loyal to Thaksin Shinawatra and his sister Yingluck from assuming power. Second, while the junta has agreed to the idea of a referendum, the specifics – such as whether people will be able to vote on the whole draft constitution or just certain sections – remain unclear. While the generals have agreed to consult the public on the constitution, they will also want to do it in a way that allows them to gain decisive support for the document and ensure that the final draft still advances their key objectives.